I spent most of today working on Day Jobbery, including declining an invitation to a conference call tomorrow morning from someone who should have well known by now that I am on vacation from tomorrow through a week from Friday, but so it goes. Lisa went and visited with her friend Nan (they go back to Lisa's Los Alamos days), and then early this evening we met Nan and her friend Groot for dinner at the Flying Star Cafe & Bakery. Lisa doesn't know if or when we'll ever be back in Albuquerque, so she treasures being able to visit her old friends here. After dinner, Lisa asked if we could drive back out to the west of the city and come down Central Avenue (old US-66), which we did. We also stopped and topped off the minivan at the Flying J so we'll start with full tanks tomorrow. The price was $1.80/gallon, and we've seen prices as low as $1.76, which is more than a dollar less than what we paid in Las Vegas. 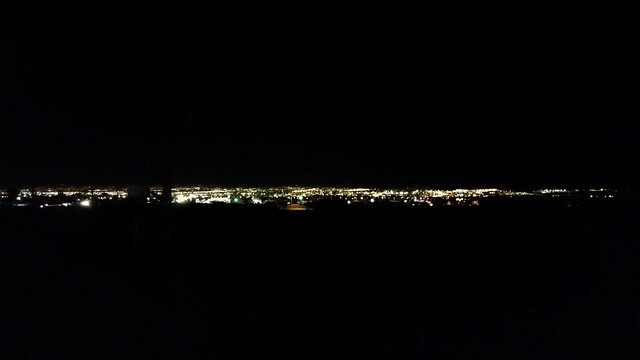 My phone's camera does not do justice to the view of the lights of Albuquerque as seen from the bluffs to the west of the city. As it happens, the place I pulled over to take a picture was immediately opposite from an RV park in which Lisa lived for a while when she was going to college. She says she used to bicycle down Bridge St (which diverges from Central at this point). It was much faster going to school than coming back. After following Bridge and then Central back down to the city, with a brief diversion to have a quick look at the train station, we returned to the hotel, where we took pictures of a safety hazard that Lisa had reported to the management during the day. The Hyatt Place Albuquerque Airport is undergoing renovations, and painters have been working on the hotel during the day. 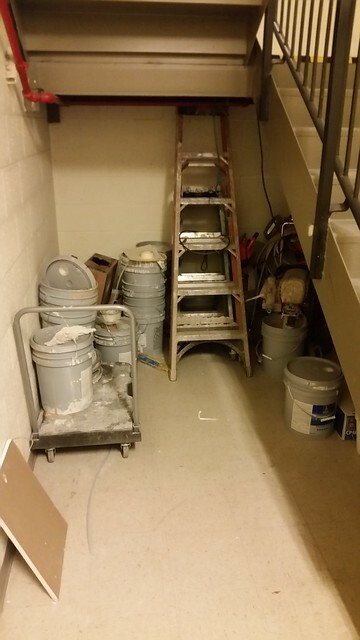 They are storing paint, solvent, and other potential hazards in the stairwell, which they should not be doing. There have been known hotel catastrophes caused by doing this. 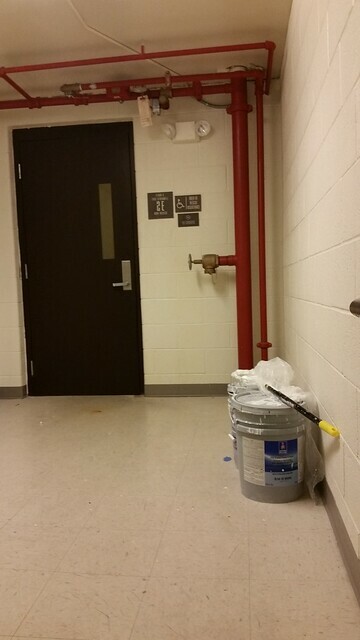 More paint is stored on the second floor landing. Lisa talked to the manager about this during the day, and he told her he was unaware this was happening and that he'd talk to them about it, but obviously he didn't do anything about it. Lisa will sleep uneasily tonight, and combined with the included breakfast not being up to the level of the Holiday Inn Express (which isn't a very high bar IMO), her enthusiasm for staying in a Hyatt in the future is dimmed to say the least. The next two days' trips are relatively short, because we're actually a bit ahead of where we need to be and are driving to Fort Worth, but that's just as well, I think.